Ask us about how to join our christmas club! The Quin family were the winners of the Christmas Ham Scooter Prize Draw – well done! 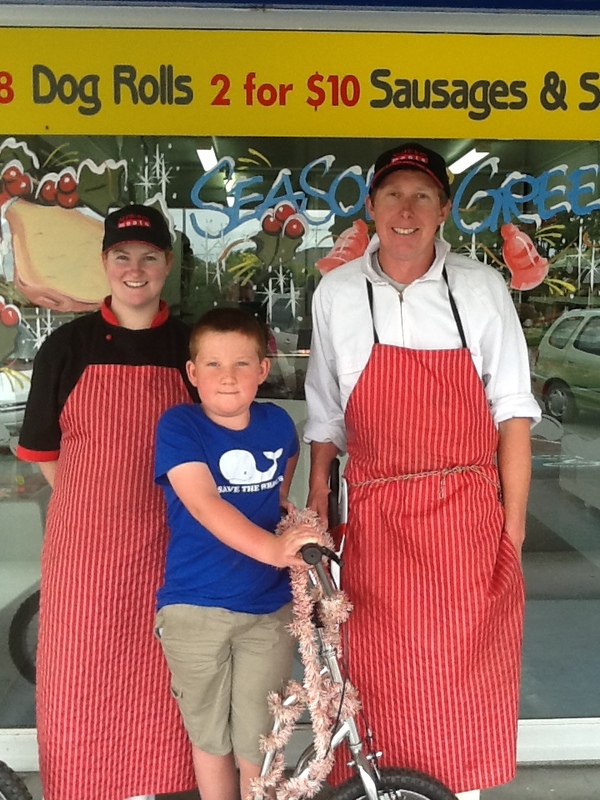 Congratulations to the Quin family, winners of the scooter in the Netherby Meats Christmas ham draw. Everyone who bought a ham from the store was put in the draw for the prize, which is sure to be put to good use. To find out more about Netherby Meats’ Christmas Hams, click here. The team at Netherby Meats would like to wish you a very merry Christmas. We are all busy for the festive season, filling all those Christmas ham orders, be sure to get yours while you can! Check out the latest Netherby Meats eNewsletter here. Welcome to the Netherby Meats Newsletter! Below you will find this fortnight’s online specials and the latest news from our family owned butchery in Netherby, Ashburton. Got a big event coming up? This week’s special on pre cooked sausages is just what you’ve been waiting for. Specials on Chipolatas and Porter House Steak make dinner decisions easy, so come in and visit us today. For more information, visit www.netherbymeats.co.nz – We look forward to seeing you instore! Netherby Meats’ finest middle bacon, shoulder bacon, whole ham and half ham were all accepted to stand against NZ’s best and took the BRONZE PRIZE for shoulder bacon late last month. Come in and try some of our award winning bacon today! This Porter House Steak from Netherby Meats is a real treat, so don’t miss out on our web only special. Simply print the coupon and visit us instore to redeem. For more recipe ideas, visit the list of links on our Netherby Meats recipes page here. Did you know that Netherby Meats also offer a processing service and have our very own Did you know that Netherby Meats also offer a processing service and have our very own mobile abattoir? We make things easy, with anonline booking systemand processing order forms: just tick the boxes and you’re done! Visit our processing page to find out more. Welcome to the Netherby Meats Newsletter! Below you will find this fortnight’s online specials and the latest news from our family owned butchery in Netherby, Ashburton. This month we competed in the NZ Ham and Bacon Competition and came home with a bronze award for our shoulder bacon. Why not try some today? Netherby Meats were proud to enter four categories in this year’s New Zealand Bacon & Ham Competition. The butchery’s finest middle bacon, shoulder bacon, whole ham and half ham were all accepted to stand against NZ’s best and took the bronze prize for shoulder bacon. Come in and try some today! Chicken nibbles are always a favourite with the little people in your family. Quick and easy to prepare, they are the perfect answer to that 5pm panic. For more recipe ideas, vist the list of links on our Netherby Meats recipes page here. Did you know that Netherby Meats also offer a processing service and have our very own mobile abattoir? We make things easy, with an online booking system and processing order forms. No more long phone calls, just tick the boxes and you’re done! Visit our processing page to find out more. Welcome to the very first Netherby Meats Newsletter! Below you will find this fortnight’s online specials and the latest news from our family owned butchery in Netherby, Ashburton. This month we competed in the NZ Ham and Bacon Competition and came home with a bronze award for our shoulder bacon. Why not try some today? Bacon and Ham are not the only cuts of meat that Netherby Meats specialise in. This week’s special on Pork Bones is sure to be a winner. For recipe ideas, vist the list of links on our Netherby Meats recipes page here. 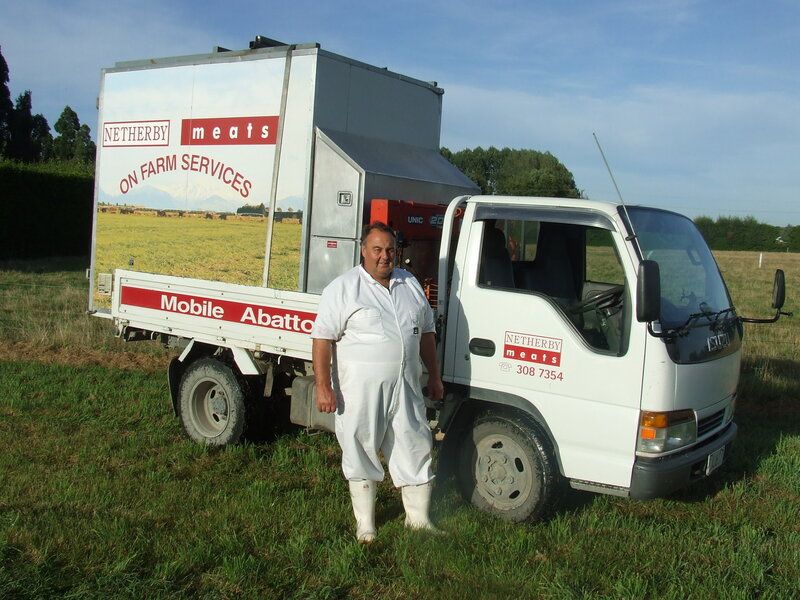 Did you know that Nethby Meats also offer a processing service and have our very own mobile abattoir? We make things easy, with an online booking system and processing order forms. No more long phone calls, just tick the boxes and you’re done! Visit our processing page to find out more. Netherby Meats have entered in this year’s NZ Ham and Bacon Competition, to be held in Wellington on July 13. The butchery’s finest middle bacon, shoulder bacon, whole ham and half ham have all been accepted and will stand against NZ’s best. To vote for the Netherby Meats products and help us win at this year’s event, text BANDH 156 to 244. Netherby Meats now have a new format for online specials! Visit our specials page and download and print the coupon to receive gigantic savings on meat. Past specials have included chicken, bacon, mince and salami. With prices as low as $9.95kg for stewing steak and $5 for 3 lots of sausage meat (special valid 12/06-26/06), you’d be mad to miss out. Don’t forget to check back regularly for updated offers exclusive to website visitors. Homekill has been in the news recently, with ‘Cow-pooling’, or the sharing of beasts for meat, profiled on TVNZ’s ‘Sunday’. Mike also appeared on the Breakfast show on Monday morning as chairman of the Federated Farmers Rural Butchers. Netherby Meats offer a Mobile Abattoir service and bookings can be made online here. To find out more about the Netherby Meats Home Kill service download an info pack or give Mike a call on (03) 308 7354. With ‘Cow Pooling’ in the spotlight following last night’s Sunday programme, Federated Farmers Rural Butchers believes it has a role to play in reconnecting the public to their food. “Cow Pooling, from what I saw on Sunday last night did seem legitimate,” says Mike Hanson, Federated Farmers Rural Butchers chairperson. “The impression I got was people taking shares in a farm animal, which was then processed through a licensed abattoir. If that’s the case the meat is legitimate. So much so, they’ll even pay a Beef+Lamb NZ levy on it. “By dealing direct with a farmer and then through a licensed abattoir, consumers seem to be bypassing the supermarket end. The farmer arguably gets more for their stock while the licensed abattoir involved gets increased volume. “That’s much different from homekill, which also featured last night. Homekill falls under the Animal Products Act 1999 and is legislation we honestly feel works. We’d be concerned if there was a move to tighten as it will only drive the black market we’ve got problems with. “So is homekill for everybody? Probably not. It’s really only an option for those people who want to be actively involved with the animal they’ll end up consuming. “If you aren’t a farmer or farm worker, the Animal Products Act says you must be actively engaged in the ‘day-to-day maintenance’ of an animal for 28-days before it can be processed. That said it’s potentially a good thing to reconnect people to their food. “That connection’s important as the Sunday Star Times quizzed 21 primary students and all thought cotton socks came from animals. Some students thought scrambled eggs came from plants while most were convinced yoghurt grew on trees. “Rural Butchers are qualified to humanely dispatch animals, in what for the animal is a relaxed and natural setting. We’ve got the equipment and the skill to professionally and safely process the animal into whatever cuts the customer desires. “Being professionals regulated by the Food Safety Authority, we know what to look out for in an animal and if things aren’t right, we won’t process it for human consumption. A number of our operators are dual operators meaning they can process homekill on retail premises. “What Sunday’s ‘Cow Pooling’ story tells us is a growing number of people want to deal direct with farmers and have a connection to the meat they eat. Somehow, I don’t think this is a fad,” Mr Hanson concluded.